According to ChemOrbis, players in Egypt report that US PVC prices are witnessing steep declines in the country, tracking generally bearish sentiment in polymer markets and weaker upstream costs. In addition, players commented that prices are also facing pressure from lackluster demand in the country as many converters believe that further decreases will be obtainable in the coming weeks. 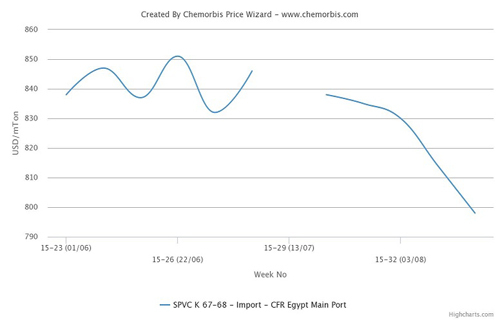 According to data from ChemOrbis Price Index, import PVC prices on a CFR Egypt basis have posted a sharp decline of nearly $50/ton over the five working weeks since the end of the Ramadan holidays, with average prices on a cash equivalent basis dropping below the $800/ton threshold for the first time since late January. Since Egypt sources virtually all of its PVC import requirements from the US, the graph above fully depicts shifts in US PVC pricing to the country.